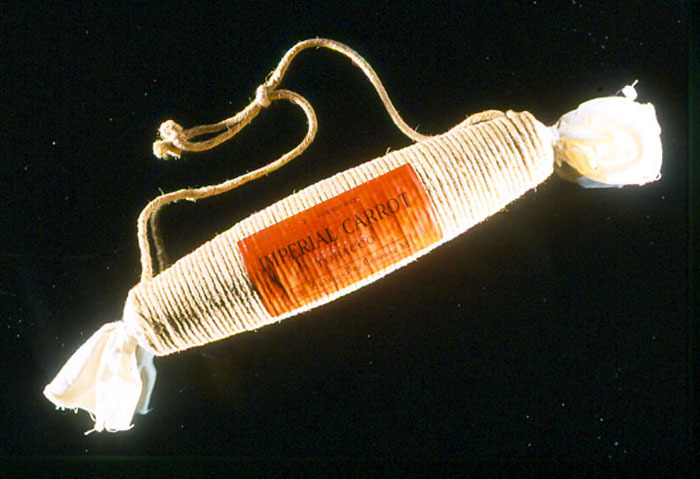 Reproduction of a three-pound “carrot” of tobacco. The tobacco is wrapped in cloth and bound with twine. The label identifies the contents as Imperial Tobacco, the weight of the contents, and the Hudson’s Bay Company as the supplier. This reproduction was made for the Hudson’s Bay Company as a gift by the Imperial Tobacco Company according to one type of packaging that was popular in the 18th century. You'll need a pipe for your tobacco. Check the Beaver Index - e.g., Tobacco for the Fur Trade, by Marius Barbeau & Clifford Wilson, March 1944. Various forms of tobacco were traded, including long ropes of compressed leaves, “twist tobacco” consisting of tobacco leaves twisted into a teardrop shape, and “carrot tobacco”, which was a tight bundle of leaves rolled up in linen bound with cord and shipped in canvas. The carrots varied in size from .45 kg to 1.36 kg or more. Tobacco grown in Brazil was one of the common items traded for furs by the Hudson’s Bay Company and was preferred by Aboriginal traders over other types. Between 1720 and 1774, over 65 tonnes (144,000 pounds) of tobacco were traded at York Factory. Prior to conducting trade, Europeans would offer a gift of tobacco to Aboriginal traders as a sign of good will and as an inducement to exchange goods. Tobacco also played a major role in formal trading ceremonies that were celebrated at the major posts. Considered to be a sacred plant, Aboriginal traders offered prayers by conducting a pipe ceremony to honour the renewal of old trading partnerships with Europeans or to celebrate the creation of newly negotiated alliances.